mar Robert Blennerhassett and had issue. mar perhaps around 1660 to Capt. Robert Blennerhassett and had issue. Elizabeth Conway, mar c.1700 to John O'Connell and had issue. 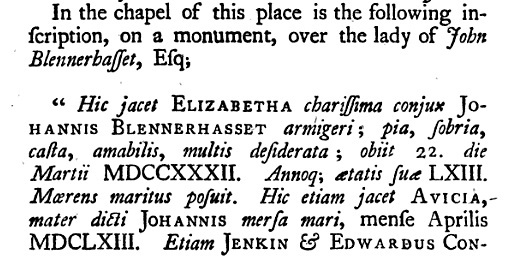 Inscription on the Conway-Blennerhassett tomb at Castle Conway recalls Jenkin and Edward and Avice Conway. From p.148 of [Smith, 1756].